New York’s Finger Lakes: The Next Great Wine Region in America? Prohibition pounded the region’s grapegrowers, but small and medium-sized producers are finally starting to mount a serious comeback. At a time when the local food movement has inspired many consumers across the nation to, for the first time, consider the wines being made in their own backyards, no up-and-coming domestic region has received as much serious attention as the Finger Lakes of upstate New York. 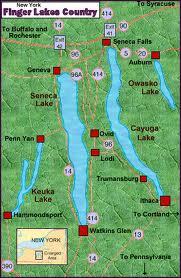 To be specific, it is the Rieslings of the Finger Lakes that have generated the most buzz. Wine is produced in all 50 of the United States from Kentucky to Hawaii. California dominates the market with about 90 percent of production, followed by New York, Washington, and Oregon, respectively, according to the Alcohol and Tobacco Tax and Trade Bureau’s 2009 Statistical Report. Considering that New York produces more wine than either Washington or Oregon, many American consumers are much more likely to have tried a Pinot Noir from Oregon or a Chardonnay from Washington than a Riesling from the Finger Lakes. Indeed, even in New York City, wines from both Washington and Oregon make fairly frequent appearances on some of the city’s best, or at least most enlightened, wine lists. So why is it that wines from these two far-flung states have managed to upstage the wines from just a few hours north? According to Jim Trezise, the president of the New York Wine and Grape Foundation (NYWGF), while New York State does make the second largest quantity of wine in the United States after California, about 80 percent or more of the state’s total wine production is through Constellation Brands, and goes into products like Arbor Mist. The rest of the state’s wineries are small-to-medium sized producers who insist that the region’s delayed blossoming is a direct consequence of a legislation-fueled game of catch up. There is a palpable sense that the winemakers of the region place much of the blame on the legislation of yesterday for putting them so far behind. They are quick to tell you how prohibition pounded the region’s grapegrowers and winemakers into the ground and left only a handful of mega-producers in its wake.